Kacy Bragg sets the ball for Warsaw Saturday night. The Tigers lost a 3-0 final to host Conocrd in the sectional finale. DUNLAP – The Concord volleyball team, this time around, was not in a sharing mood. The Minutemen, when it mattered most, were not about to let Warsaw get in their way of a championship Saturday night. Concord came prepared to defend its sectional title and did just that in topping the Tigers 3-0 in the title tilt of the Class 4-A Concord Sectional. The hosts, who ended up having to share the NLC title with NorthWood after seeing a 2-1 lead evaporate into a 3-2 home loss to Warsaw in the regular-season and league finale Oct. 5, were a highly-motivated bunch. 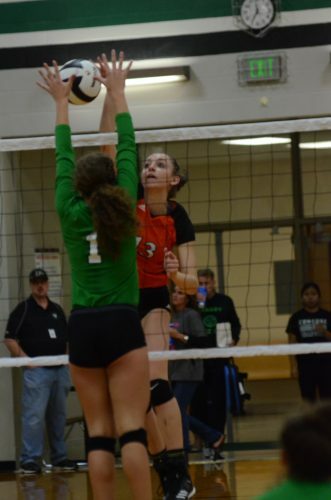 Concord, which had lost twice to Warsaw during the regular season, made the third time the charm with hustle, aggressiveness, big play at the net and a stellar showing defensively to come away with an impressive 25-20, 25-23, 25-14 victory. The Minutemen, who improve to 22-9, claim the program’s 10th sectional title and second in a row. Concord advances to the LaPorte Regional next Saturday to face No. 4 ranked Crown Point in the first semifinal match. Crown Point, which was state runner-up in 2016, won the Lowell Sectional title Saturday night. The Bulldogs beat Lowell 3-0 to claim their third straight sectional crown. The Tigers, who were bidding for the program’s first sectional championship since 2004, end their season at 22-14. “Our girls just wanted this so bad,” said Concord coach Kelly Chupp. “They were motivated all week. We had the best week of practice that we have had all season coming into the sectional. The girls got up early this morning and came in for a practice. They were ready for this. I’m just so proud of them. Senior Emali Grose prepares to serve. The Minutemen beat Warsaw 3-1 in a sectional semifinal match a year ago at Warsaw. Concord then topped Elkhart Central in the finale before losing to LaPorte in the regional. Concord, with six seniors starting Saturday night, set the tone early in racing to an 11-7 lead. The hosts were up 20-15 before Warsaw rallied within 21-19 before Chupp took a timeout. 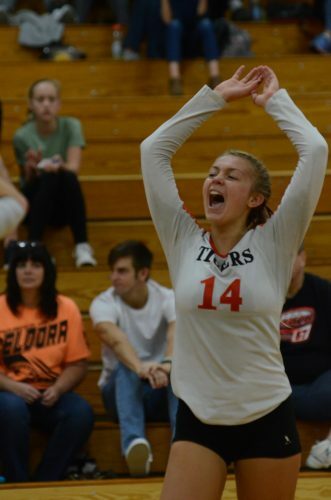 Junior Keegan Thursby then had a kill for a 22-19 lead before Kacy Bragg answered for the Tigers to make it 22-20. Thursby then delivered again to make it 23-20 before Warsaw used a timeout. The Tigers then had an attack error and a player called for being in the net to give Concord the final two points and the opening set. The second set turned out to be a pivotal point. It was nip-and-tuck early before Concord opened up a 16-10 lead. Warsaw roared back to pull within 21-20 as senior Hanna Lech drilled a kill off a Minutemen blocker. Thursby stepped up again with a kill to make it 22-20. A Concord error and a huge service ace by Elizabeth Schmidt for Warsaw tied it at 22-22. After a Concord timeout, a Tiger hitting error gave the hosts a 23-22 lead. A Concord service error knotted the game at 23-23 before another Chupp timeout. Audrey Staggs then delivered big time with a kill and a block to give the Minutemen the 25-23 win. 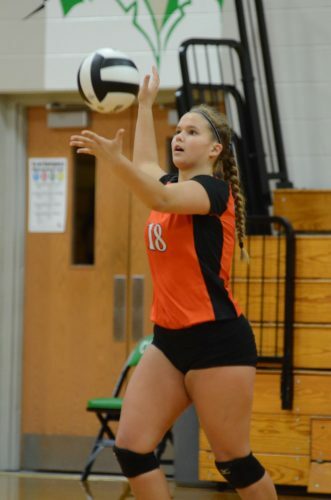 The Tigers, who also beat Concord 2-0 in the Michigan City Invitational on Sept. 16, could not recover in the final set. Concord jumped to a 10-4 lead and were not threatened. Staggs ended the 75-minute match with a kill for the final point. 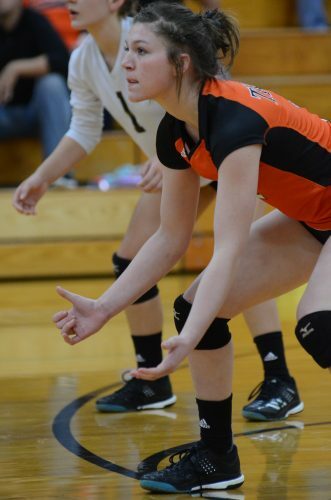 Hanna Leach blasts a kill for the Tigers. “They outplayed us and wanted it more,” said second-year Warsaw coach Rick Ashmore. “You have to show up at the biggest times and tonight we were not aggressive. You have to want the ball. We talked about that before the match. Concord stepped up and went after it. Warsaw loses five seniors in Nikki Parrett, Emma Gelbaugh, Lexie Day, Hanna Leach and Emali Grose. Day and Leach both started in the sectional final. Parrett missed most of the season due to a knee injury. The Tigers were also without junior Rachel Yeager all season due to a shoulder injury. 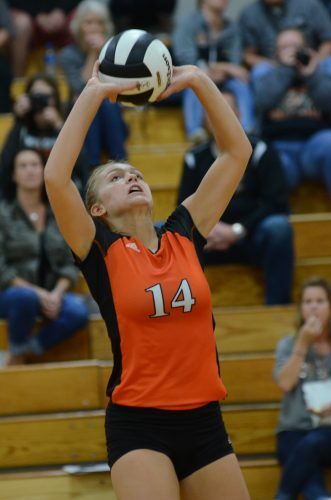 Warsaw is set to return plenty next year, including junior standout setter Kacy Bragg, junior libero Erin Peugh, junior Katie Swanson and the outstanding freshmen trio of Elizabeth Schmidt, Kennedy Lauck and Betty Barnett. The Tigers punched their ticket to the finals by rolling past Goshen 3-0 in a semifinal Saturday morning. 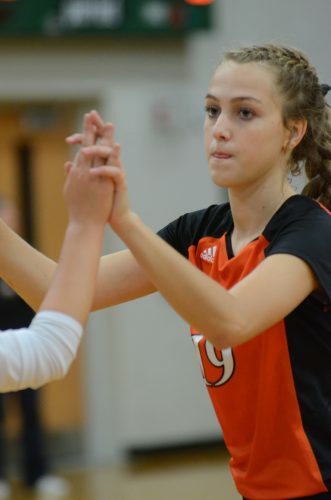 Warsaw did not trailed in the first two games en route to a 25-12, 25-17, 25-16 win. The trio of Lauck, Day and Swanson dominated the net for the Tigers. Warsaw beat Goshen 3-0 during their NLC regular-season matchup too. Concord had no trouble in its semifinal with a 25-9, 25-14, 25-18 win over Elkhart Central. Nikki Parrett readies to receive a serve. Kacy Bragg celebrates during the semifinals Saturday. 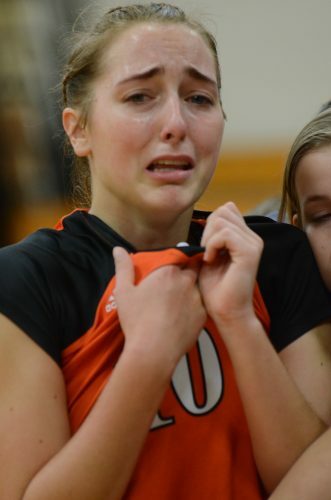 Lexie Day is overcome with emotion.